The 2014 edition of The Gambler is less a remake of the 1974 Karel Reisz-directed drama than a highly stylized imitation. In trying to evoke the spirit of 1970s cinema — if that was the intention — director Rupert Wyatt has made a movie that seems to include as much posturing as probing. Working from a screenplay by William Monahan (The Departed), Wyatt tells the story of Jim Bennett (Mark Wahlberg), a college professor and desperate gambler who’s trying to pay off a major debt by (what else?) gambling more. Bennett owes $240,000 to the kind of people who aren’t big on forgiveness. The gambler in the original — the grandson of a powerful Jewish businessman who built a life from nothing — tried to prove that he had the nerve to walk on the dark side, that, he too, could be a jungle cat on the prowl. James Caan’s Axel Freed courted risk even when he knew he was being stupid about it, and Caan nailed the role. Wahlberg isn’t an actor you’d automatically cast as a college professor, but then — in 1974 — neither was Caan, who was still best known for playing Sonny Corleone in The Godfather. Wahlberg works at conveying a sense of brilliance, defeat and arrogance, but he appears to be fighting an uphill battle, working a little too hard, and you may find yourself wondering whether he isn’t sometimes straining to play against type. Moving the story from New York to California and updating James Toback’s original screenplay, The Gambler can’t quite make its grit credible, either. This self-conscious sense of toughness mixed with smarts is nowhere more apparent than in the portrayal of John Goodman’s Frank, a bald, decidedly overweight mobster whom Bennett approaches for money. 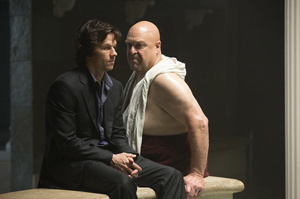 Goodman stands out as a shirtless Jabba-the-Gangster, but his character is treated as if he were an effect, a big rock dropped into the story solely to make a splash. The New York gambling milieu gives way to a West Coast environment in which a group of Koreans run an illegal gambling establishment. Bennett loses big money to the Koreans, and the boss of the casino (Alvin Ing) wants it back. Indifferent to personal safety, Bennett borrows $50,000 from a loan shark (Michael Kenneth Williams) who makes it clear that he’ll play rough if he’s not repaid. Bennett also has no qualms about asking his wealthy mother (Jessica Lange) for money, which she reluctantly gives him, prompting a scene at a bank that mimics a similar scene in the original. Of course, Mom should know better. Will Bennett use the money to pay his debts and walk away? Nah, he’ll gamble more. Bennett isn’t exactly Mr. Chipps in the classroom. He berates his students, finding only one of them worthy of literary study, a blonde coed played by Brie Larson. She tries to establish a relationship with Bennett. He resists — until he doesn’t. Wyatt (Rise of the Planet of the Apes and The Escapist) certainly knows how to give a movie visual polish. Overall though, The Gambler seems soulless and synthetic, unlike what felt twisted and real in the 1970s. I won’t give anything away, but if you have the time and interest, compare the way the 1974 and 2014 movies end. That should tell you everything you need to know.